Before being approved for commercial release in late 2017, the single Kymeta™ Kyway™ terminals underwent extensive sea trials on board two iconic superyachts – S/Y Maltese Falcon and M/Y White Rose of Drachs. With its cutting-edge design, the Maltese Falcon is a truly extraordinary superyacht and ideal for trialling this next generation technology. For the four month-long trial, the iconic 89-meter sailing vessel was equipped with both single and multiple-terminal configurations and utilized capacity on three Intelsat assets, IS-29e (Caribbean), IS-32e Wide Beam (Bermuda/Atlantic) and IS-905 (Europe). Sailing from the Caribbean, across the Atlantic to the Mediterranean, the trials were an astounding success with the flat panel antennas delivering continuous high-speed internet across the vessel, every mile of the journey. The ability to seamlessly switch between the four panels avoided any issues with mast shadow while the Kymeta panel remained connected regardless of sea motion, pitch and roll, and actually exceeded initial expectations of the electronically-steered beam. We were thrilled to partner with Kymeta on this sea trial because connectivity is critical on the water. Kymeta’s consistent connection allows us to maximize the use of the Falcon’s sophisticated onboard network, and to offer our guests and crew cutting edge communications and internet service together with the latest in on-demand entertainment options. We were very excited to partner with the White Rose of Drachs for the first-ever motor yacht sea trials with Kymeta communications solutions. Installing four Kymeta KyWay terminals, we worked closely with the owner, captain, and IT manager of the White Rose to perform the months-long sea trial. The terminals were tested with various MIR/CIR services from leading maritime satellite service providers, including Speedcast, which provided service in the Mediterranean. Multiple terminal configurations were trialled, ranging from single panel solutions to multiple panel solutions. While there were a few practical installation issues, they were immediately addressed by Kymeta. The trials presented Kymeta and e3 engineers with the opportunity to identify and replace various components – both hardware and software. As a software defined antenna technology, Kymeta KyWay terminals used at the trial were given improved and added functionality, remotely, which has never been possible before with traditional mechanically steered antennas. The trialling period also afforded Andrew Schofield, captain of the White Rose, to witness first-hand the ease with which Kymeta communication solutions can be updated and managed – even while at sea. One day while testing the Kymeta solutions at sea, the e3 Systems and Kymeta teams removed terminals, changed components, and reinstalled them within minutes.” With conventional antennas, we would have been in the yard for a few days with a crane to achieve the same results. The quick installation of the Kymeta solution is a big time and money-saver. The White Rose of Drachs fully intends to progress to the finalized fully-integrated solution, which will rid the yacht of the current VSAT and TVRO domes. It will also remove over five tons of weight from her super structure and provide the yacht with permanent access to the internet. 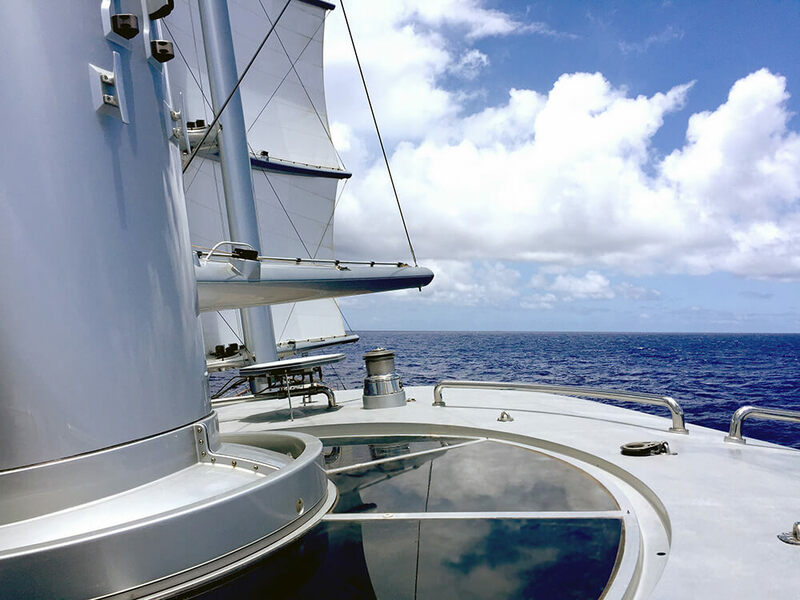 With the single panels installed and operating on many yachts across the Caribbean and the Med, testing of the multi-panel solution is going full steam ahead. The ongoing sea trials of the combiner and arbitrator are on target to – both essential elements of the multi-panel solution.